Return to Italy or "Falling in Love with Venice"
I don’t think I realized how much of a part of my life Italy would become. Between planning and preparation for the trips, time spent abroad, and mental processing upon return, most of the last year has revolved around Italy and the art center. Pretty cool. For the second trip I did not leave as far ahead of the other students and was able to spend more time helping with preparations at the studio in Long Beach before we left. I did leave a little early though and even planned a few days in Venice before taking the train to Tuscany. I really didn’t like Venice last year. It was simply too much, and too many people. The Biennale sent my mind for a flip, but I was barely able to take in the rest of the city. I think I blocked a lot out just to stay sane. This year was different. For starters I didn’t check a bag. And my phone pretty much worked in Europe (after a quick 30 minute customer service call). We had booked beds at La Pescheria Backpackers Hostel, but having booked a bit late for the season we didn’t have many options. It wasn’t until we were on the boat from the airport that I realized pescheria means “fish market” and maybe this wasn’t the best place we could have chosen. Once again, I was wrong. The fish market is not only a beautiful attraction, it’s quite centrally located. And the hostel didn’t smell, well not like fish anyway. Last year we had to stay on Lido because of the large group, not that we could have gone out much because of the curfew. I was tired when I arrived but decided to have a coffee (or three) and not rest until night so I could make the time change. The hostel, like anything not on the Gran Canal was impossible to find. Once we settled in I went for a walk and was immediately struck by just how calm the city was compared to my expectations. The droves of tourists were much thinner, and maybe I had even learned to see past them a little. As the sun began to set I came across a swanky art-opening-looking-affair in a gorgeous palazzo right on the Gran Canal. I took a mental note to return later. It turns out I had stumbled onto not the Art Biennale, but the Architecture, Theater, Dance, and Music event which happens on even years. In fact I had stumbled into the pre-opening parties full of free wine and cheese and books. I found the work and people presenting it to be much more approachable than at the Art Biennale. Granted, the scale is much smaller and I was not there for the main event. Many exhibitions focused on materials, and the way people physically and psychologically interact with spaces and elements within spaces. I took a much slower pace (there was less to see and I had not created any internal expectation of seeing it all) and found myself spending a lot of time with many works and installations. Much of the work was interactive, which I think lent to a more welcoming and inclusive atmosphere. 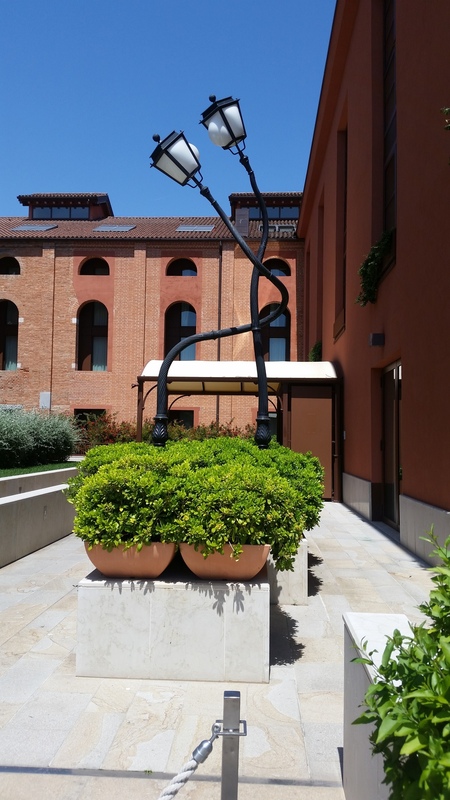 I was also able to return to Murano, and rather than having tunnel vision for only the Glasstress exhibition I took a lot of time in the streets and even went into the glass museum. I still went back to the Glasstress site and found another glass rod in the planter out front. Having maps working on my phone was a huge help, but we also spent time exploring the residential side of the island. There are serene walking paths along the fences of prized gardens tended by the elderly. It was also a good launching point to Burano, which I had not previously visited. They were having their Spring festival, so there were more tourists on the island than usual, but it was an exceedingly beautiful day. To save money we decided to take a night train to Tuscany rather than pay another night in the hostel. The only problem was that the train to Florence only takes 2 hours. I got a little creative and found us a 7 hour trip to Siena which left Venice right after midnight. So my last memories in that magical city was sitting on the steps between the train station and the canal sipping wine from a plastic cup watching the people and boats go by. I’m trying to forget about the train ride. So how did I go from wanting to get out of Venice as quickly as possible to anticipating my next trip? Part of it was that the crowds were thinner, but part of it was also my attitude toward them. By focusing on all the beauty around me I was able to mostly tune them out. The selfie sticks on the bridges are still a bit much though. I think another big change in my attitude was not being driven to try to get everywhere and see everything while I was there. By going at a more natural pace I was much more engaged in what I was actually looking at and not thinking about the next place I needed to be and how to get there. Now I have fantasies about having my MFA exhibition in Venice 2019.